Men and women did not have to be at the front to be at risk in the Great War. Air raids and dangerous war work also threatened life and limb. Hannah Spash spent her late teens and early twenties as a munitions worker and was injured three times. 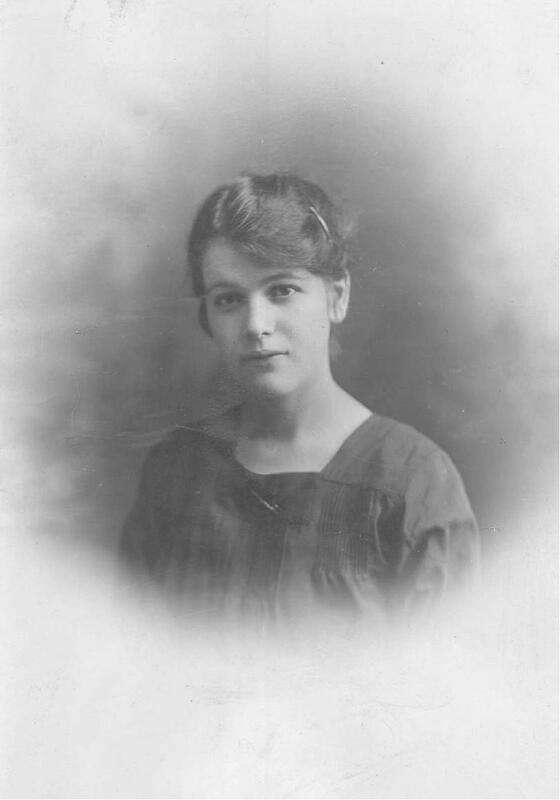 Hannah Spash was born in 1897, second-youngest daughter of blacksmith George and his wife Kate Spash. They had married in around 1883 and had 11 children in total. By the 1890s, the family were living in Camberwell, where the last six of their children were born. In 1911, the family (parents and those last six children) were living at Alfred Cottage, Lower Abbey Road, Belvedere – between Woolwich and Erith in what is now South East London, but was then part of Kent. Hannah and her younger sister Polly were too young to work, but their brother Isaac was an engine cleaner for the South Eastern and Chatham Railway Company (which had a monopoly on rail travel in Kent), one sister worked as a domestic servant and another in a laundry. Middle sister Lillian, though, had managed to get a job as a clerk to photographic slide manufacturer. Hannah Spash, a happy-faced girl of 20, is one of the girl workers to whom the King and Queen spoke during a visit to a munition factory in the London area yesterday. “The King asked me whether I liked the dangerous work better than any other,” she said later, “and I replied, to the King’s amusement, ‘Well, I have been blown up three times, your Majesty, so I have got used to it.’ And so I have. The first time I was very lucky. A pot of a certain chemical dropped in my shed and the explosion blew an arm off the girl standing next to me, but I escaped almost unhurt. “The second time the explosion blew up the table at which I was working, and it was wonderful that I did not have both legs blown off instead of having only a knee and foot dislocated and my face badly scarred. You can see the scars now. The third time was when I was working in a gunpowder shed. The explosion blew the shed to pieces and killed two girls. I was flung out on to a field, and only recovered consciousness while being taken home. Despite her apparent keenness to work in dangerous factories, Spash survived the war. In the early 1920s, she married Joseph Dawson, with whom she had at least one child. She provides an great example of the work done and bravery shown on the home front during the Great War. The image is distinctly (and understandably) reminiscent of the more familiar pictures of tube stations during the Second World War. It depicts civilians sheltering from the an air raid in the tunnels and on the platform at Elephant and Castle. Twenty two years after the end of the Great War, in November 1940, Bill Brandt went into that same underground station in South London and photographed Londoners sheltering from the next generation of German bombers. The first week of September was the peak of the recruiting boom in 1914, in London no less than in the rest of the UK. Nearly 200,000 men joined the armed forces in that week, including over 21,000 in London. One of our abiding memories of 1914 is the recruiting boom or ‘rush to the colours’. Contrary to some popular impressions, this was not simply based on some notion that the war would be ‘over by Christmas’. The peak came after the news arrived at home that the British Expeditionary Force had suffered great casualties at Mons and were now in retreat. People rushed to the colours at the moment of utmost danger, not because they all thought it was going to be a brief, glorious lark. Looking at each of the first nine weeks of the war from the declaration of war on Tuesday August 4th, it is clear that the peak came in the fortnight after news from Mons arrived. This news was not the only factor: the increase in unemployment in wartime, a general sense of duty, and for some a sense of adventure also played a part, among other individual factors affecting each man joining the army that summer. However, the timing suggests that the risk of defeat (and fear of invasion) played a large part. That first week of September, 191,000 men joined up across the UK, almost as many as had joined up in the whole of August (195,000). In London, the 34,730 had joined up by 31 August and another 21,870 joined in the first week of August. It is worth remembering that even the recruiting levels in August were vast compared with peacetime. In each of the last few years of peace, between 25,000 and 30,000 men had joined the army (including Territorials) each year, between 4,000 and 5,000 of them in the London recruiting district (which included areas that were then in the surrounding counties but are now in London, such as Stratford in East London/Essex). 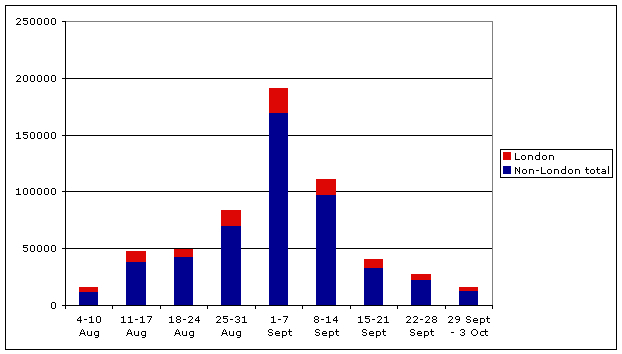 Every week from 11 August to 21 September saw a larger intake than each of the preceding years had done – the peak week of 1-7 September brought in more than six times the peacetime level of enlistments! If we look at the daily figures we can see that it was the middle of that week that saw the absolute peak nationally, with over 27,000 enlisting on Wednesday 3rd and over 29,000 on both Thursday 4th and Friday 5th. Interestingly, though, the peak days in London were slightly different. In fact the peak day here was Tuesday the 9th, when 4,833 men joined up in the London recruiting district (more men than had enlisted here in the whole year up to the end of September 1912). The only other days when over 4,000 joined up were Tuesday 1st and Wednesday 3rd. 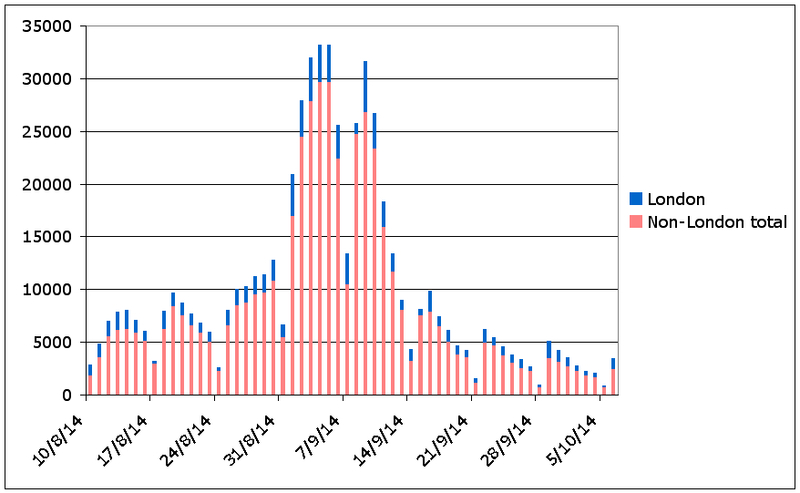 It is not clear why these dates were the peaks, but local fluctuations in towns and cities could be based on an intensive local recruiting effort (such as a large meeting or campaign by a local army unit) or the effects on local employment of the war, or indeed of the weather or seasons – such as the end of harvest in the countryside. The recruiting boom of 1914 was a unique event in British history, with hundreds of thousands of men joining the armed forces (and particularly the army) in the space of a few days. It is a poignant moment in retrospect as we know about the battles that faced these men over the next four years. Those men who joined up in August and September 1914 fought, and many died, in some of the most famous and bloody battles in British history. We can look at the statistics and timing and get some sense of why so many enlisted at that point, but each man’s story up to the point that he entered the recruiting office was unique, just as each man’s experiences after enlistment were different. Today, England and Australia are due to start a series of one-day international cricket matches (although the rain my wipe out todays match). Official ODIs began in 1971, but one-day matches had been a staple of local cricket for years and in the Great War they were even pseudo-international matches. The first official One Day International (ODI) took place between England and Australia in January 1971 in Melbourne. The format is current one 50-over innings per team, with the highest score winning the match. Prior to this, though, one-day games had been played in various different formats around the cricketing world. The demise of first-class county and international cricket in 1914 did not mean that there were no more cricket matches. Some of the professional cricket leagues continued (somewhat controversially) and the public schools matches carried on, while military units played charity matches. Some of the latter drew large crowds at the big cricket grounds of England. The Australian War Memorial have photos from one one-day match in which London cricketers did particularly well – and it was a game between England and Australia. Or rather it was between a British Army XI and the Australian Imperial Force. On 14 July 1917, raising money for St Dunstan’s charity for blind ex-service personnel, the two teams took the field at Lord’s before a large audience. Several first-class county cricketers and a few internationals participated in the match at Lord’s on Saturday between an English Army XI and the Australian Forces. The Englishmen won, scoring 165 for nine wickets against 130 [all out] for the Australians who batted first. Lieutenant Kelleway hit 53 out of 89 for the losers. Tyldesley (Lancashire) 38, Captain P.F. Warner (Middlesex) 34, and Lieutenant-Colonel J.W.H.T Douglas (Essex) 26 [sic] were the best-known English scorers. Private Lee, the Middlesex bowler, took five wickets for 23 runs. J.W.H.T Douglas and P.F. Warner were also Londoners. Johnny Douglas (nicknamed ‘Johnny Won’t Hit Today’ Douglas by Australian fans in honour of his slow scoring) was born in Clapton, while ‘Plum’ Warner was a long-standing part of the Middlesex team and the MCC set-up in St John’s Wood, living in Chelsea and in Portland Place before the Great War. Both were Test captains for England and were Wisden players of the year – Douglas in 1915 and Warner (unusually) the single player of the year in 1921. Douglas also won the gold medal for middleweight boxing at the London Olympics in 1908. Kent’s David Jennings, who scored 26 runs, was also a Londoner – born in Kentish Town. Charles Kelleway, the top-scoring AIF batsman, was an all-rounder who played in 26 Test matches (it’s not clear to me from the Express report whether he scored 53 from 89 balls or in a partnership of 89 with E.P. Barbour). The only other Test players in the team, Matthews and Macartney (another future player of the year), were dismissed cheaply.